Heat oven to 350°F (325°F for dark or nonstick pan). Generously spray or grease 12-inch pizza pan. In medium bowl, mix Crust ingredients; press in bottom of pan. Bake 8 to 10 minutes or until golden. Make brownie batter as directed on box. Gently spread brownie batter over graham cracker crust. Bake 23 to 25 minutes or until toothpick inserted 2 inches from center comes out almost clean. Sprinkle Hershey's™ Mini Kisses™ milk chocolate over marshmallows. Cool 20 minutes; top with chocolate bars, sticking into marshmallows. Cool completely, about 1 hour. 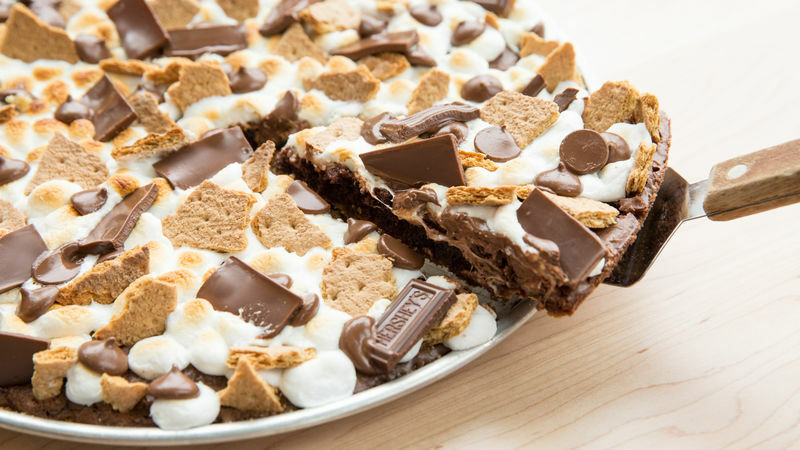 Place brownies in the refrigerator to firm up the chocolate on the pizza faster. If you don’t have Hershey's™ Mini Kisses™ milk chocolate, you can use 2 additional broken candy bars.